A car bomb killed 13 soldiers and wounded 56 when it ripped through a bus carrying off-duty military personnel in the central Turkish city of Kayseri on Saturday, an attack President Tayyip Erdogan blamed on Kurdish militants. The blast near a university campus comes a week after deadly twin bombings targeted police in Istanbul and may further infuriate a public smarting from multiple attacks by Islamic and Kurdish militants this year, and a failed coup in July. It could also increase tension in the mainly Kurdish southeast, where militants from the Kurdistan Workers Party (PKK) have waged a three-decade violent insurgency that has seen some of the worst fighting in the last year. “The style and goals of the attacks clearly show the aim of the separatist terrorist organization is to trip up Turkey, cut its strength and have it focus its energy and forces elsewhere,” Erdogan said in a statement. Erdogan frequently refers to the PKK as “the separatist terrorist organization”. The PKK, which wants autonomy for the Kurdish minority, is considered a terrorist group by the United States, the European Union and Turkey. Turkey, a NATO member and part of the U.S. coalition against Islamic State, has also been angered by Washington’s backing of Syrian Kurdish fighters against the Sunni hardline group. Ankara sees the Washington-backed Syrian Kurdish militia as an extension of the PKK and is worried the advance of Kurdish fighters across its borders in Syria and Iraq could inflame Kurdish militants at home. Erdogan confirmed that 13 people had been killed and 55 wounded in Saturday’s blast. Officials later raised the number of injured to 56, including four in critical condition. All of those killed and 48 of the wounded were off-duty military personnel, the military said. The bus was mainly carrying privates and corporals, it said. The bus was stopped at a red light near the campus of Erciyes University in Kayseri when a car approached it and then detonated, broadcaster NTV said. Militants have previously targeted buses carrying military or security forces. There was no immediate claim of responsibility, but government officials likened the attack to last Saturday’s dual bombings outside the stadium of Istanbul soccer team Besiktas, later claimed by a PKK offshoot. Forty-four people died and more than 150 were wounded in that incident. Deputy Prime Minister Numan Kurtulmus said similar materials were used in both attacks. In comments probably aimed at Washington, he called on Turkey’s allies to stop support for militants. “This is what we expect from our friends: Not just a few messages of condemnation, but for them to fight on an equal ground against these terrorist organizations with us,” Kurtulmus said in a television interview. The United States condemned the attack. Russian President Vladimir Putin told Erdogan in a telegram that Russia was ready to increase cooperation against terrorism, Russian news agencies reported. 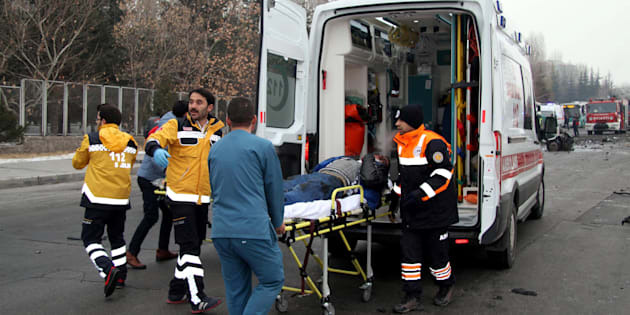 Authorities had detained seven people so far and were seeking another five in relation to the attack, Interior Minister Suleyman Soylu said. Turkey faces multiple security threats including spillover from the fight against Islamic State in northern Syria. It has faced attacks from Islamic State, Kurdish and leftist militants. Deputy Prime Minister Kurtulmus said the attack had deliberately targeted Kayseri because the city is known for its strong nationalist sentiment. Later on Saturday, a crowd stormed the local headquarters of the pro-Kurdish Peoples’ Democratic Party (HDP), parliament’s second-largest opposition party. The office was vandalized and some documents set on fire, a party spokesman said. The HDP condemned the bus bombing and called for an end to politics and language that creates polarization, hostility and violence. Thousands of Kurdish politicians, including the two leaders of the HDP, have been detained in recent months on suspicion having links to the PKK. The crackdown has coincided with widespread purges of state institutions after July’s failed coup, which the government blames on followers of a U.S.-based Muslim cleric. Turkey says the measures are necessary to defend its security, while human rights groups and some Western allies accuse it of skirting the rule of law and trampling on freedoms.